Hi, all! Mais um post da série Inglês com Cartoons. Como é de costume, temos um cartoon com uma fala, perguntas e um exemplo. Você usa a imaginação para dar suas próprias respostas em inglês nos comentários. (a) Who is Sarah? Quem é a Sarah? (b) What’s the reason for Jake’s visit? Qual a razão da visita do Jake? (c) Where is Jake headed after this meeting? Para onde o Jake vai após essa reunião? (a) Sarah is a famous web designer. Sarah é uma webdesigner famosa. (b) Jake wants to hire Sarah to design his website, which he thinks is going to become a very successful business. O Jake quer contratar a Sarah pra fazer o design de seu site, que, ele acredita, vai se tornar um negócio de muito sucesso. (c) He’s headed to the dentist. Ele vai ao dentista. E você? Quais seriam as suas respostas? E aqui vai o PDF com o cartoon anterior (clique na imagem ao lado) – I had a wonderful time – com todas as respostas, editadas quando necessário, para quem quiser guardar. (a) Sarah is a city’s mayor. 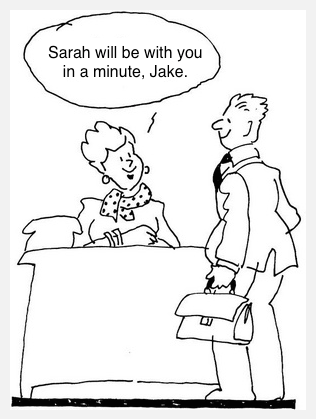 (b) Sarah wants to hire Jake’s services as a lobbist to help her to win reelection. (c) H’1s headed to his office. Hi there to every , because Ι am truly eager of reading this web site’s post to be updated regularly. A- Sarah is a psychologist. B- Jake is a patient of her. C- He’s headed to his work. Sarah is a lower. Jake can be a lower too. He wants to talk to her. A- Shara is a lawyer. B- Jake wants to take someone to court. C- he’s headed to the airport afterwards. a) Sarah is a doctor. b) Jake sells drugs. He is show a sample to doctors and explain all information. c) He goes to visit other doctor. I think de same thing!!! Lol.